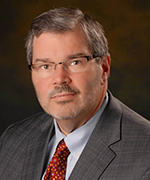 Prior to his appointment as founding dean, Halverson served for eight years as director and State Health Official of the Arkansas State Department of Health and member of the governor’s cabinet. Dr. Halverson also served as the director of the Division of Public Health Systems Development and Research and as a member of the Senior Biomedical Research Service for the World Health Organization Collaborating Center for Public Health Practice at the Centers for Disease Control and Prevention (CDC). Prior to his appointments in public health, Dr. Halverson served as a hospital administrator in Minnesota and Michigan. Dr. Halverson’s research interests focus on public health systems and services research — primarily on public health infrastructure and organizational effectiveness.